Jason Aldean bassist Tully Kennedy: "Being a studio musician in Nashville is challenging. You don’t spend two days on a song; you’ve got a half-hour"
Tully Kennedy was 21 years old when he left upstate New York for Los Angeles in 1996. Growing up in Redford, population 600, he had spent his teens playing bass in cover bands and was ready for the next chapter in his career. On his way to the West Coast, he detoured in Nashville to visit his uncle, a staff songwriter at Warner-Chappell Publishing. The plan was to spend a few months there and move on. Growing up on rock music, with an affinity for The Police, U2, and Tom Petty and the Heartbreakers, Kennedy admittedly knew and cared little about country music, other than the “badass and edgy” outliers Steve Earle and Dwight Yoakam. Within a week of his arrival, he met Michael Knox, who was running Warner-Chappell and working with a new artist named Jason Aldean. Kennedy soon found himself in the company of studio veterans like Michael Rhodes and Mike Brignardello, and discovered that the Nashville recording scene was, in fact, eye opening. During this time, he met guitarist Kurt Allison and drummer Rich Redmond. They quickly connected and became known as The Three Kings, a top-call session trio and the nucleus of Aldean’s band, never imagining that the then-unsigned singer/songwriter would take them all to unimaginable success, recording albums that have sold over 15 million copies, charting 20 Number One hits, and performing in front of hundreds of thousands of fans on tour after tour. That was more than 20 years ago. Now, in 2018, Kennedy is celebrating almost as many years with Aldean, who released his eighth album, Rearview Town, on 13 April. Also this year, Kennedy received his third nomination as Academy of Country Music Bass Player of the Year, and has a new Artist Signature Set of nickel-plated Blue Steel strings from Dean Markley. Still, with all that has happened, he remains a bit incredulous and humbly grateful for his many accomplishments. It’s interesting, when one makes the mistake of reading comments online, the distance between Points A and B: those who respect the level of Nashville musicianship and those have no clue or don’t take it seriously because there’s a “rock band” quality to what this band does. "We were a rock band when we met Jason, but it’s been a good fit, and it really works in arenas and stadiums. We didn’t change anything when we all got together. We didn’t 'try to be country.' We just tried to record great songs. "I think the respect factor is there, but I come across some of that stuff from time to time, comments that say we’re playing country songs like we’re in a rock band. I will tell you this: it’s been fun being able to make these records and take them on the road. The whole thing is a blast, and it’s more fun today than it’s ever been. We haven’t lost that edge or fire." You’ve been a Dean Markley artist since the late-’90s, and now you’ve got signature strings. Why do you prefer nickel-plated over stainless, and why do mediums work best for you? "Around the end of 1998, I tried their strings on a bass. I called the company, and they gave me a string deal when I didn’t have a lot going on. I was young, had been in town a couple of years, but I wasn’t playing massive shows or gaining that type of exposure. But they saw potential. "I’ve always loved the feel of nickel strings; I could never get used to steel. So I put these nickel-plated strings on, and the tension and feel were amazing. They really are part of my tone. People ask me about them all the time, and I tell them it’s a perfect blend of feel and tone. You’re not sacrificing one for the other. "The medium strings had a heavier D and G, which I could never get used to, and the medium light had a slightly smaller A. I grew up playing .45 - .105 and .128. My gauge is an .80 on the A string, which is slightly smaller, it’s not an .85, but I find that tension is magical. Some of the magic comes when you don’t have to attack the strings super-hard. "If the tension is high, you’re attacking hard all the time, and I like to have a little more feel in the strings. I like to play with as much dynamic as possible. With the .80, the tension of the whole bass seems to slightly back off, so you can dig in when you want to, but you can also feel the string when you want to lay back." "I don’t love brand new strings, so when I put them on, I like to get at least a couple of hours of play on them. On the road, in the summertime, if it’s 100 degrees and we’re playing amphitheaters, I’ll probably get three shows out of them just because they get sweat all over them and feel grimy. If we’re playing arenas, I’ll get six shows out of them. "But you’re sweating 10 times more inside, so it’s not that the strings are going dead; it’s that they’re getting that coating of sweat from your hands on them. So on tour, on average, I change them every fourth show. In the studio, I’ll go a couple of weeks. You’re a longtime Sadowsky man. How long have you played Sadowskys and why are they right for you? Also, it seems that consistency is big with you: after twenty years, you’re still using the same basses, amps, and strings. Maybe change is not your thing? "Exactly. I don’t like to change. A lot of this is loyalty, too. Michael Rhodes turned me on to Sadowsky. Roger Sadowsky built me a bass in the late ’90s, and he knocked some money off of it for me, and he didn’t have to. Those basses are my thing. I’ve been playing the P/J 5’s. 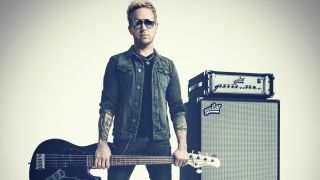 "Especially with Jason, we do a lot of stuff in drop-tuning, and so those basses have been the sound on every Jason Aldean record, every track. I can’t say enough about the craftsmanship and sound. Again, that is my tone. "The same thing with Aguilar. They came on with me in 2000 or 2001, when they were a brand-new company. I can’t say enough about them as people, but also the consistent build quality of everything they make. "I am the definition of a creature of habit, yeah. I like to stay with what’s working. I did hit one bump in the road. We had a huge flood here [in 2010] and I lost a lot of my old Aguilar gear. It was in our studio lockers, so it was under eight feet of water and mud. I was fortunate to find those pieces again and buy some of them online. Mike Brignardello had some of the same pieces I use, so he gave me those, and I was able to rebuild my stuff. "I’ve had the same Aguilar 900 DI that was on the road with us - I’ve had that thing since 2002, I think. They don’t make them anymore, so it’s been challenging. I use the same exact gear in the studio. The Aguilar 680 has been my mainstay. It’s probably the best piece of studio gear ever made, in my opinion. So yeah, those companies, the quality of the stuff, and the way I play just seems to work for me." “Best piece of studio gear” - why? "I feel like whatever’s coming off my hands is coming out of that 680. It’s a nice, clean, direct sound, and it’s got tons of punch, tons of control. And I run the thing flat, it’s not like I’m messing with the EQ. "There are engineers in town that have gone out and tried to find 680s because they love them so much after we track with them. It’s just a great, solid piece of gear. I don’t record with an amp in the studio anymore. I take the 680, and it’s so punchy and clean. "Again, for what I want, it settles perfectly in the track. I don’t feel like anything’s getting in the way of my tone. It’s not changing a thing, which has always been a big deal to me. I like to feel whatever I’m playing. I don’t want it to be altered by a piece of gear. I like to hear the wood of the bass." What is on your pedalboard? "I learned from watching Michael Rhodes play when I was young. The wah is something I got from him. It makes an appearance every now and then in the bridge of a song or maybe an intro. I use it in the studio and on the road. I use the Dunlop Bass Wah, which is the greatest wah pedal. "Sometimes I use the Aguilar Octamizer pedal with the wah to create some weird sounds in a track, something different. You’ll hear that in certain breakdowns of our songs. "I still have all my original pedals - you know, creature of habit. I have a volume pedal, wah, Fulltone distortion, Aguilar distortion, an octave pedal, an old Boss Chorus pedal. A lot of these pedals I’ve had since the late-’90s. "I did lose my main studio 'board in the flood, and I had a lot of old pedals on that, but I had a backup pedalboard on the road, so I was still able to have a lot of old pedals. I have a couple of different boards, but they’re pretty consistent. I have one I use for television shows that only has the wah and a couple of other things. So it’s all the same but maybe varies slightly." Which in-ears do you use? "Ultimate Ears UE 11’s, the top of the line. We went to in-ears in 2005, and it was an adjustment, because since I was 11 years old I was playing in bands with wedges and amps. All of a sudden, you go to in-ears and it’s 'I don’t like this,' but then you start to love it because you can really hear everything for the first time. It took a little bit to get used to, but now I can’t do without them." Do you practice on the road, or do the gigs become your practice? What about at home? "Nowadays, it’s not so much practising as it is playing certain exercises to keep my hands not feeling tight. I’ll do an hour a day of hand exercises on the bass, whether it be some sort of scales or something that keeps my dexterity moving, because the older I get, my hands will tighten up slightly from so much use. "I’ll spend at least an hour before a show playing up and down the neck. Even when my hands feel great, I try to do that regardless. Especially with the five-strings I play, it’s a bigger bass, a bigger neck, so hand fatigue can come in quicker. "I play my four-string on two or three songs a night and the rest are on the five-string, so it’s nice to be able to exercise that during the day and keep things loose." How did you find your place between two guitar players? "When you’re in a guitar band, it can be hard to find your voice with a bunch of riffs going on. When Michael Knox produces this band, he never tries to alter anything. If he says, 'This part’s not working,' I’ll play something else, but for the most part it’s been some sort of weird anomaly where it all works together, for whatever reason. It’s that magical thing you can’t put your finger on. He lets us do our thing, and maybe that’s where we get some of that rawness. "Being in a band for so long, the intuition is there and usually it’s right. When we made this record, there were one or two songs where Michael said, 'That’s not going to work with the guitars.' I said, 'Yes, it is.' He said, 'I don’t know if it is.' Then I heard it and said, 'You’re right, it’s not.' It was hard for me when I was younger. I would be, 'I know what I’m doing is right.' But as you get older, you learn and you start to take critique better and not be so 'me, me, me'. "With the guitars, you’ve got to be able to sit back, especially with this genre of music. The biggest thing in country music is the songs tell a story, so you’ve got to work with the lyrics as well. You’ve got the guitars doing their thing, then you’ve got Jason singing, and on bass you’ve got to be careful. "On the road, Chris Stephens, our front-of-house guy, is so good. He’s a master at finding a spot for the bass. It can be challenging, especially in an arena, where the bass can kind of get away from you, but he reins it in and gets me in the mix, where you do hear all the parts - because there are parts in these songs. The bass is moving around quite a bit, so you’ve got to fit that in." How do you keep your sound consistent night after night? "The constant for me is my Aguilar rig and my Sadowskys. It’s all about knowing my gear. As a professional bass player, you’ve got to understand that your rig is going to sound slightly different every night on different stages and the way the PA is going to react where you are. But with my stuff, I know what I’m used to, so I never have to mess with my settings. It’s 99 per cent consistent every night. "I think some guys get caught up in changing gear a lot, or maybe searching for the ultimate thing, when it really ends up in your hands. It’s a cliché and it’s been said a million times, but tone comes from your hands. So I lean on what I hear, and my Sadowskys and my Aguilar, and there it is." How much does the rhythm section drive country music? Has that changed as the genre has changed? "I’ve been playing with Rich since 1999, and for the rhythm section to work, you’ve got to be in each other’s heads. I’ve got to feel where Rich is going to put his kick pattern. I’ve to feel where he’s going to put the chorus. You only get that from playing together for years. "The way it’s changed… in the old days we’d just go track a record. Now everybody’s using loops. We use them too, but inside the loop there might be a kick pattern or some kind of beat you have to play around, and that has added another wrinkle. I let Rich figure out how he’s going to play the loop, and I fit my stuff in there and make sure it’s working with both. "When we came on the scene, country music was fiddle, acoustic guitar, vocal, and a kick drum and snare, and somewhere in the distance was a clean electric guitar. And bands didn’t play on the records. We were the opposite. We played on the records with Jason and you could hear the guitars. Nowadays, everybody’s doing that. Look at Eric Church - he’s guitar-heavy. "The genre is wide open. You’ve got guys playing hip-hop, playing heavy metal, you have acts that are very pop, all of which is fine. I respect any artist that can carve out a niche for themselves. If you’re filling an arena, you’ve done something right. That’s no fluke. You can’t fill 18,000 seats a night if no-one’s digging it. So if someone is headlining a tour, whether I think the music is great or not, I’ve got to respect what the artist has done." You are also a producer and songwriter. Does that come into play when you’re tracking with Jason? "Sometimes I’ll say something in the studio, and Knox will look at me and say, 'You play bass.' And he’s right. When we’re making Jason’s records, I play bass. We have input and it’s a team effort, but that is my role. My job is to do what I’ve always done and not mess it up, because things have worked for this long. "But it’s a tough room. You’ve got to have thick skin. A lot of joking around goes on, so you have to be ready for it. It’s all done in fun, but part of being in a band is knowing your role and staying in your lane, which is the best advice I try to give young guys - that you can never know everything and you can never learn too much." This is a tight unit that has spent two decades living and working together. What do you see when you look at the timeline? Who were you then and who are you now? "It’s a big jump. When we were younger, we were slightly off the rails. You’re young and all of a sudden you’re having success, and you don’t always handle that success right because you don’t know what you’re doing with that end of it. I’m not going to say we were Mötley Crüe, but our reputation for a long time was that we were going to play hard, we were going to party hard, and that was what we did. "As you get older, you’ve got families, you’re not exactly kids anymore, and with that comes responsibility that breeds even harder work. So you phase that other part out of your life, hopefully, which we’ve done. "Being in your 20s versus being in your 40s is a way different deal when you’re on the road. That side of it has been great. There’s a good, settled-down feeling that’s taken place over the last few years. When we’re home, we’re writing and producing, so it’s not like I come home and just rest. I’ve got kids and two other jobs. I enjoy that part of it - working hard, taking care of my family, and keeping my head on straight. "As a player, I’d like to think I’m more disciplined. When you’re 24 or 25, you know everything. It takes 20 years to realise that you don’t and you didn’t and you just want to be better. I do enjoy that mature energy. It’s a fun transition. We’re focused on making good records, and whatever roll we’ve been on, trying to keep that going." When did you notice you were reaching this level of success? "It happened slow and fast. From 1999 until 2004, we did - I’m not kidding you - 40 to 50 showcases with Jason when he was looking for a record deal, and everybody passed two or three times. They didn’t get it. A rock band with a country guy? 'This is not going to work.' It was Michael Knox’s vision and no one got it. "In 2004, Jason signed a deal with Broken Bow Records, we went to make that first record, and we thought, 'This will be the only record we will ever make.' We made a video for our first single, Hicktown, and in that video we’re all drinking Crown Royal and we’re hammered, because we were like, 'We’re never going to make another video. This is it.' It was so out there. Looking back on it, it was craziness. "Then My Kinda Party  came out and it was huge. Dirt Road Anthem came out, and we had all these songs that took off. At one point, we were playing for 28,000 people a night, playing stadiums and doing big things. I think that’s when we started to feel what was going on. It was a really big record, and all those songs still play the biggest out there. "We had a huge duet with Kelly Clarkson [Don’t You Wanna Stay] that crossed over to pop, so new people were coming to see us play. After the dust settled from that album, we could all breathe, but I look back on that tour and I don’t know if we knew then how big it was. We were so afraid of it ending that we never rested. We kept working harder to make better records." In an industry where everything can end tomorrow and there’s no guarantee of a next hit, is that level of success as much make-or-break as the hungry years? "Yes, yes. Everything is temporary, and I give Jason and Michael so much credit, because it’s a fine line between trying to do what maybe is current but also keeping your brand, which is the key to any artist’s longevity, especially with trends changing as fast as they do today. "If you get caught chasing what you think will make new fans like it more, that’s when things get dicey. We’ve always tried to make sure that we’re not going to change what got us here, and what got us here is not overthinking, not chasing something, and just doing what we do. "We’ve felt the ebb and flow, for sure, but you’ve got to stay the course and do what you do. We try new things, but it still comes down to the same singer, same band, same everything, and we’re not going to change direction. It’s about putting out great songs and the strength of the catalogue. "Our goal has never been, 'Let’s try to get a song to go to Number 1.' It’s always been, 'Let’s try to get a song that people are going to care about 10 years down the road.' That’s what gives you a career. "When you talk about success, that’s it, those songs that strike a nerve. It’s not the chart position. It’s about the longevity of that feeling of that song. That’s what you strive to do: make songs that people are going to care about years from now."